Motherhood is one of those things we can define both by our actions and our emotions. Motherhood: It’s about pacing the floor at 2 a.m. with a crying child, trying to soothe both of you. It’s about pacing the floor just before midnight when your child is out on his first solo date – and driving. It’s about pacing the floor while your child is in surgery, because you need something to do and can’t sit still and time is moving so slowly. Motherhood: It’s about praying when your child is crying and you don’t know why and nothing you do seems to offer comfort. It’s about praying when your child is away from home that he will return safely. It’s about praying when your child is in surgery that she will be healed. Motherhood: it’s about praising your child for sleeping through the night. It’s about praising your child for acting responsibly when she’s driving. It’s about praising your child for being brave when facing sickness or adversity. Motherhood is one of life’s greatest blessings and one of its greatest challenges. It’s the one full-time job we accept having no real training. We are able to learn some of the basic life skills, like cooking and diaper changing and chauffeuring. But most of the special things mothers do come through on the job training. You learn to accept sticky hugs without a wash cloth, lopsided clay vases without art criticism, and words spoken in anger without retaliation. You learn the value of each precious minute of time spent with a child, teaching them, playing with them, and most of all loving them. 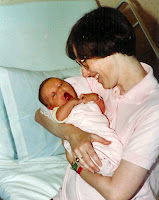 I am thankful that I had a wonderful mother to teach me that motherhood is one of life's greatest privileges and joys. I am so very thankful that I have been blessed with the wonder of being a mother; that I have been able to watch our two children grow from tiny babies into fabulous, self-sufficient, intelligent adults. My message to the two in our family who are about to be mothers: I wish you much joy and happiness and wonder as you spend the rest of your life pacing, praying and praising as part of the glory of motherhood.